Hollywood has a way of making investing more exciting than I’ve ever found it to be. The Big Short, Wolf of Wall Street, Margin Call, etc. all seem to be trying to capture the feel of an action movie in the backdrop of the financial world. Backroom multi-billion-dollar deals, pump-and-dump schemes, and the frenzy of boiler room-esque Wall Street offices glamorize a core idea: if you’re willing to go all in, you might just get lucky and come out with millions. See, most people seem to skip over the word might. Sure, you might get a big payoff. You might pick the right stocks. You might win the financial lottery. But there’s never a guarantee—and oftentimes the risk far outweighs the miniscule chance at a big windfall. When I’ve had clients who are mulling over the idea of putting a chunk of their retirement nest egg towards a risky investment opportunity, a common sentiment is a fear of missing out on a chance to strike it rich. They’ll admit they don’t want to look back and regret not getting in on the ground floor of an investment opportunity, and the salespeople pushing this “opportunity” are only too happy to fan the flames of that worry. Oftentimes, it’s not even about the client themselves making a large profit, but rather a drive to make sure their families are financially secure after they have passed away—again, another sentiment that can easily be preyed upon. 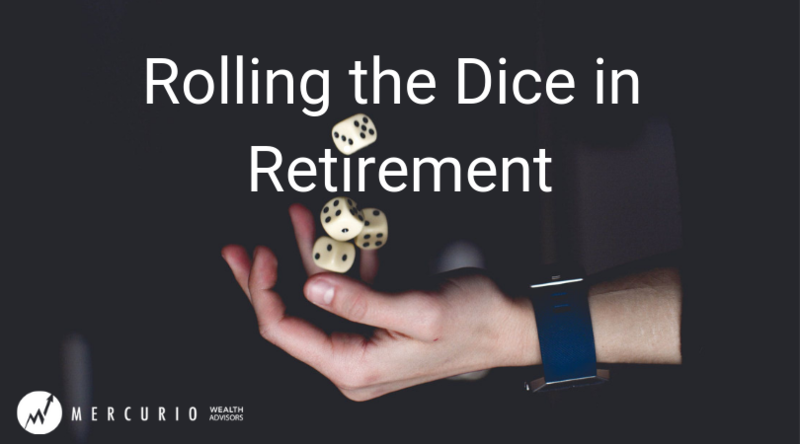 Some might argue that retirees tend to be more gullible when it comes to get-rich-quick schemes, but I’d disagree with that as well. The problem is that when you start to dive into the risks of investing in shaky schemes, what comes up first is all the people who made it big. They took the jump and – bam – they won! Worse yet are stories about people who have regrets about not going for it, and how much they want to turn back the clock to go all-in on a deal they missed out on. There’s this underlying notion to readers telling them to not be “that guy” who had some fantastical financial opportunity and yet stepped away from it. The missing piece is input from the people who took that same jump and lost. For every story of someone getting lucky, there are 10 untold stories of people who lost a portion of their retirement that they couldn’t afford to lose. There are others who perhaps netted some sort of profit which pushed them to invest more, only to lose their luck on the second go-around. But no one wants to talk about the losses, because no one wants to read about them. After all, think about the lottery: do you hear stories about all the people who bought tickets and lost? Nope—the only thing that ever makes it to the newsroom is the winner! The biggest piece of advice I give clients in this position is to ask themselves if things go badly and they completely lose all the money they invest; will they still be 100% secure? If the answer is even a slight “I’m not sure”, it would be a hard no from my perspective. If you are considering pursuing an investment opportunity that you’d like some insight on, I encourage you to speak with your current financial advisor or call our offices for a free evaluation. Trust me when I say you’d rather be in the shoes of the person who skipped out on a potential win compared to the guy who rolled the dice and lost big.